Texas state trooper Brian Encinia, the officer who arrested Sandra Bland, recently appeared in court to plead not guilty to a perjury charge. According to The Los Angeles Times, Encinia, who was accompanied by his lawyer Chip Lewis and guards from the Texas Rangers, was met by protesters outside the courthouse, who reminded him of the role he played in Bland’s death. After Encinia violently arrested Bland for a minor traffic infraction, she was jailed and three days later found dead in her cell. The medical examiner ruled her death a suicide. 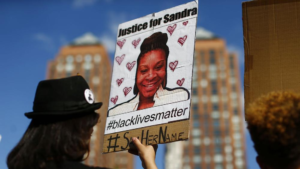 The Times reported about three dozen protesters, including Black Lives Matter activists, held signs reading “What happened to Sandra Bland?” and “Stop police brutality & terror,” outside the courthouse in Hempstead, which is 55 miles west of Houston. Bland’s mother, Geneva Reed-Veal, and a group of family members were also present in the courtroom. Reed-Veal has demanded more information about her daughter’s death and is currently suing Waller County Sheriff R. Glenn Lewis, jail workers and the Texas Department of Public Safety. She has also become a national spokesperson on police violence and has appeared with Democratic presidential candidate Hillary Clinton at campaign events. According to The Times, Encinia, who was fired by the Department of Public Safety, was indicted by a Waller County grand jury in January. The grand jury stated that he had lied about the circumstances under which Bland left her car. If convicted of the misdemeanor perjury charge, he faces a $4,000 fine and up to a year in jail. Lewis, Encinia’s lawyer, said the case was being fueled by “emotion” and the “media.” He also said that it set a dangerous precedent for police officers who could be prosecuted for simply doing their job. The Times said Reed-Veal met supporters outside the court with hugs. The next hearing is on May 17. Bland’s arrest and death raised international awareness about the treatement of Black people in police custody. But she wasn’t the only person. According to ThinkProgress, at least four other Black women died in jail in July.